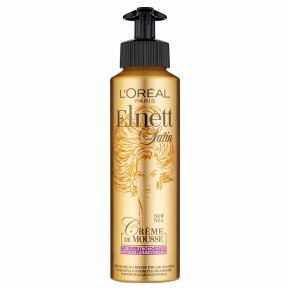 Sumptuously defined curls and ultimate satin-soft touch.Discover our new Elnett Strong Hold Curl Crème De Mousse. The hold of a mousse with the care of a delicate cream. Achieve sumptuously defined curls that are flexible and full of bounce. Provides humidity protection and frizz prevention, for smooth and tamed hair. The exclusive crème formula has a satin-soft touch; it delicately melts on the hair's surface to nourish curls and intensely hold the hair. Soft feel, lightweight and non-greasy.